World of Warcraft: A Better Venue for Practical Experience than College? My son is also a very avid player of the online game World of Warcraft - a massively multiplayer online role playing game. The game is actually quite fascinating to observe since it involves coordination and collaboration between many players. In many ways, I think it is a microcosm of what goes on within companies and various societal groups. I actually see my son picking up a variety of valuable skills while he is playing: leadership, diplomacy, planning, strategy, etc. The downside of the game is that it can become very obsessive (like many things in life), so we set boundaries (that are not always appreciated) like no play during school nights. The most challenging events in WoW requires the coordination of 25 people working closely as a team. It shouldn't come as a surprise that the same situations that occur in the real-word when organizing 25 people, occur in virtual worlds as well. Problem-solving, politics, leadership, communication, team-building… just to scratch the surface. 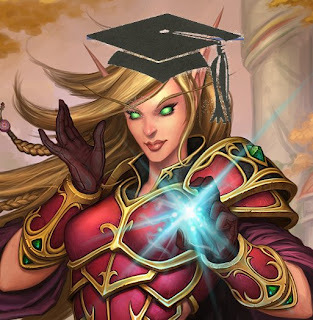 Here's a prediction for you – right now there are teen aged kids gaining more practical experience leading and organizing in WoW then they'll ever learn in college. 10-20 years from now someone will cite WoW as the formative experience that they built on to become political or business leaders. Seriously, though, if you are a concerned parent of a budding WoW player, I encourage you to keep an open mind. Sit down and spend some time watching them play. It's pretty fascinating, particularly when they get into coordinated raids. And, by all means, enforce moderation if necessary. Despite the protestations of our sons, we use the game's parental controls to define the allowable blocks of play time. The controls are convenient and help to minimize the drama and tedious negotiations around play time.